One of the most Frequently Asked Questions is “Do you take insurance?”. The long answer is: If you are in a work accident and have a c9 from your doctor, we will bill for worker’s compensation. If you do not have worker’s comp, we can give you a receipt so that you can turn in the form below to your insurance company yourself. There are several forms for getting reimbursed depending on who your insurance company is. Contact your insurance company to find the right one. 5. The procedure code is 97124 or 97140. Acupuncture 97811. 7. Enter your information as the payee. Here is one common method that insurance companies use for patients to get reimbursed. 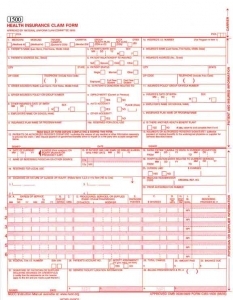 Print out and complete form CMS (HCFA)-1500. Box 1 – Indicate the type of insurance coverage applicable to this claim by checking the appropriate box. Box 1a – Insert correct insured/ID number. Box 2 – Enter the patient’s name as it appears on the insurance card or benefit enrollment forms (i.e., last name, first name). Box 3 – Enter the patient’s date of birth in MM/DD/YYYY format. Check appropriate gender box. Box 4 – Enter /insured name in last name, first name format (e.g., Doe, John). Box 5 – Enter the patient’s mailing address and telephone number. Box 6 – Check the appropriate box for the patient’s relationship to the insured. Box 7 – Enter the insured’s mailing address and telephone number. Box 9 – Enter the full name of the other person under whose insurance the patient is also covered. Box 9a – Enter the insured’s policy or group number. Box 9b – Enter the insured’s date of birth and gender. Box 9c – Enter the employer or school information for the subscriber. Box 9d – Enter the plan or program name for the insured’s health plan. Boxes 10a through 10c – Check “yes” or “no” to indicate whether employment, auto accident or other accident involvement applies to one or more of the services being billed. Box 12 – Enter the patient’s signature to authorize release of medical information necessary to process the claim. If the patient is a minor child, a parent or legal guardian should sign. Signatures can be “signature on file” and/or computer-generated signature. Box 13 – The patient’s signature in this box indicates that reimbursement is to be sent to the provider of service at the address indicated in Box 33. This can be” signature on file” and/or computer-generated signature. If the insured is to be reimbursed, this box should be left BLANK. (Note: if Box 13 is left blank reimbursement will be sent to the insured, whether or not the insured is also the patient.) Do not put any text in this box other than the signature or “signature on file”. Any text in this box may be interpreted as authorization of payment of benefits to the provider of service. If Box 29 indicates that the claim has been paid in full, the claim will be assigned to the member regardless if there is a signature in Box 13. Box 17 – If Box 17 is completed, the corresponding NPI # must be included in Box 17b. Box 21 – Enter the patient’s diagnosis/condition code(s). Use the highest level of specificity of DSM-IV or ICD-9-CM diagnosis codes. Enter up to four codes in priority order (primary, secondary, etc.). Column A – Date(s) of service in MM DD YY format. One date of service per line. Maximum of six dates of service per claim form. Column D – Enter the procedure or services using the current CPT-4 procedure codes. Column E – Enter the diagnosis code reference number (as shown in Box 21) to indicate the date of service and the procedures performed. Column F – Enter the charge for each of the listed services. Column G – Enter the number of units. Column I – The shaded field is used to identify what type of number is placed in 24J. Column J – The rendering provider’s NPI # belongs in the white box of 24J. The shaded box is for other identifying number the provider is allowed to submit. Box 25 – Enter the federal tax identification number for the treating practitioner or group. The claim will be returned if the Tax ID Number is not provided. Box 27 – Check appropriate box to indicate if the provider of service accepts Medicare assignment. Box 31 – Enter the printed/typed name and signature of provider of service, including degree/credentials. Box 32 – If Box 32 is completed, the corresponding NPI # must be included in Box 32b. Box 33 – Enter the name, group name (if applicable), licensure, address and phone number for the pay-to (billing) information. If Box 33 is completed, the corresponding NPI # must be included in Box 33b.